On any given night in Los Angeles County, more than 53,000 people seek a place to sleep. Though that number has actually dropped from previous years, structural factors persist, including climbing unemployment, stagnant wages, and insufficient affordable housing. To help address the issue, Los Angeles County is investing in two key resources: funding for housing and services and a staff to ensure that services are deployed. Los Angeles County has access to funds through a ballot measure passed in 2017 called Measure H, which infuses approximately $355 million in sales tax into homelessness services every year for the next 10 years. What the county needs now is a dedicated workforce of about 1,500 people to help those experiencing homelessness. These jobs, such as community health workers, case managers, social workers, housing locators, clinicians, and nurse practitioners, require unique training and skill sets, and finding qualified candidates has been a challenge for both the county and service delivery providers. Thatch giving a presentation about her fellowship project. 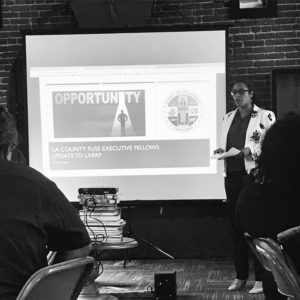 Last year, the county’s Office of Diversion and Reentry brought in FUSE fellow Thelá Thatch to help develop a plan to recruit and train staff workers who will provide critical services for people experiencing homelessness and exiting the jails. Thatch has helped build relationships with community groups, workforce development agencies, and education and philanthropic organizations to ensure alignment around strategy between the county and outside organizations. Thatch, who is a PhD candidate, an author, an entrepreneur, a wife, a mother of three, and a member of multiple Los Angeles community organizations, knows more than a little about getting everything done at once. And as the former Chief Diversity Officer of Live Nation Entertainment, and founder of a full-service human resources consulting firm, she also knows how to find and hire the right people for the job, at scale, and with attention to detail. Her expertise is human resources, exactly the gap that the county needed to fill. Like most community nonprofits and social service agencies, Los Angeles agencies have not traditionally had extra capacity to recruit, assess, hire, and onboard talent. Ironically, the infusion of money to support homeless services presented huge new challenges for overworked support agencies. Without new money in the coffers, but with infusions of cash promised, needing to maintain and support existing programs while also planning new ones, these agencies needed to pull double weight: do all the work already on their plate plus plan huge increases in scope, projects, and staff. Thelá Thatch grew up in East Orange, New Jersey, in the same school hallways and streets as Whitney Houston and Queen Latifah. Hers was a world of contrasts — living in a poor neighborhood situated not far from neighborhoods of privilege. But Thatch found a path to college after a financial aid counselor intervened. She graduated with honors, rose through the ranks of media, and built a career as a human resources executive. Investing in human beings — that’s what Thatch has been doing her whole life. capacity to hire people: defining a mission, culture, and values for a consistent brand and messaging across job boards; identifying places and ways to make job posting seamless and seen; developing outreach to applicants; defining the components of an applicant job portal that would create a good user experience. One of the agencies that’s growing its staff as a result of L.A. County’s infusion of funds is Homeless Outreach Program Integrated Care Services (HOPICS), which has been serving the homeless community for 30 years. Thatch’s workshop brought together many stakeholders in a conversation surrounding the homelessness crisis. Recruiting applicants with lived experience is exactly what Thatch has been focusing on. Lived experience, in common parlance, means having personal knowledge gained through direct, first-hand involvement, and in this capacity, it means hiring those who have experienced homelessness. Like in many cities, Los Angeles’ homeless population spans a diverse demographic, including thousands of people who find creative ways of holding down jobs while sleeping in cars or crashing on couches, showering at gyms and using public facilities. Thatch knows that applicants with lived experiences come from all walks of life. This could be their first job. It could be someone who finds the role through a welfare office. To fully grasp what it takes to expand the typical definition of the “right” candidate has meant developing a deep understanding of how systems can sometimes keep people out of employment, as well as how to recruit people into it. For example, what happens when an applicant is unable to get past the background check process? These kinds of barriers have a higher likelihood to impact those with lived experiences in homelessness. Thatch has specific experience in working with people with lived experience. 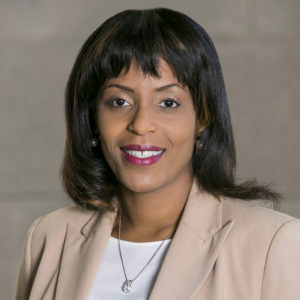 She was instrumental in designing the concept for a career pathway program called Community Promotion Academy through Trade Tech College, creating a cohort of approximately 40 students with lived experience this fall through a partnership with the South L.A. Transit Empowerment Zone and the Board of Supervisors 2nd District. The class will be designed to qualify students for jobs in homelessness and reentry. At the end of the program, they’ll be able to present a certificate that shows their new qualifications, with the hope that it will increase their chances for employment within the community-based organization and others with open jobs that support homelessness and reentry. Thatch knew that connecting people with diverse backgrounds and skill sets to the available jobs, while also minimizing agency lift, requires creative thinking. 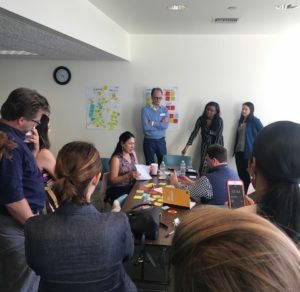 After workshopping ideas with representatives from across homelessness support services, as well as inside and outside the government, she identified a need to create a one-stop shop for potential candidates. Now, she’s working to develop a job portal to centralize available opportunities, as well as a marketing campaign, to spread the word to relevant audiences. It will be a centralized hub for past and present applicants, including integration with case managers who can help transitioning applicants coming from the prison system to find work. Katie Camp, who works in Mayor Eric Garcetti’s Office of Reentry and attended the workshop, said Thatch’s work is key to the mayor’s strategy to reduce homelessness in Los Angeles. Sara Hudson is a writer, researcher, and former government technologist. This is a great article and I wish that others would see it. There are many people who would gladly change careers, but are not being hired because of what I refer to as shortsightedness. You’ve touched on many great points in the article, such as training or re-training, cost of living salaries too lesson turnover, giving the most unlikely people chances to succeed – tools to do so and a re-training of HR personnel to meet demand by being more flexible.